Long tail pro does is highly recommended for niche websites and bloggers struggling with keyword research. It will save you hundreds of hours of hard work. Here is video tutorial and review of Long tail pro features indepth. The Keyword is one of the most important things when it comes to good SEO. Ask any SEO expert or a successful niche blogger the secret behind their success. They all will give you the same answer that they do extensive research on keywords. Every internet entrepreneur knows how important keywords are. Good SEO is impossible without doing good keyword research. You cannot expect your blog to be on the first page of Google if you are writing about things no one is searching for. It is a keyword research tools used by a majority of internet entrepreneurs. LTP analyses Google Keyword Tool data so that there is no need to calculate competition of keywords manually. Long Tail Pro does it automatically. It is highly recommended for niche websites. It is recommended for bloggers struggling with keyword research. It will save you hundreds of hours of hard work. I came across Long Tail Pro when I was looking for the best keyword research tool in the market. I consulted many niche website owners and read reviews on various forums. At first I was reluctant in buying Long Tail Pro, as most of the reviews you read are paid reviews. But when I started using Long Tail Pro I was hooked up. It offers tons of ideas about the keyword you are doing your research on. It gives you details about inbound links, page rank and money other metrics which can help you increase traffic on your website. Long Tail Pro gives you complete facility to study the competition and ranking a particular keyword, which is a great help in growing your business. This data can prove to be a game changer in determining your competition and running a successful business. These are all very useful data points to use when determining the competitiveness of a keyword. This feature collects and compiles all of the above data in a very easy to understand table structure. Long tail Pro is not the first one to add this feature, but this inbuilt feature of the Long Tail Pro will come in handy while doing your research. It is very easy to use this feature; all you have to do is enter the domain URL, keyword and the country in which you are trying to rank. After entering these details, click on ‘’check rank’’. After the check is completed, you will see the rank of your website and target keyword within Google, Bing and yahoo. It is a very important tool yet so easy to use. Unlike most of SEO tools Long Tail Pro is very fast. It is a slick tool; you can toggle between setting and keyword page. Its simplicity adds stars to its glory. Search Filter gives you an option to exclude keywords which you have no interest in. Gives you 60 days money back guarantee. You need to download Long Tail Pro if you want to use it, so you might not be able to use it on all devices. If you are facing issues with traffic and want to enhance it for your blog or website, I recommend Long Tail Pro to you, this amazingly easy to use tool will easily let you find profitable keywords and give you options to do competitor analysis. If you are a beginner trying to make it big, I suggest you give Long Tail Pro. It will help you increase traffic, rank and let you create a following on your blog. 1. Can I use this on Mac? Yes, they have both windows and Mac version available for this tool. 2. Will I have to learn this tool? It takes only 30 minutes to learn this tool. Still you’ll get tutorial videos access to learn it completely. 3. How much I’ll have to pay? 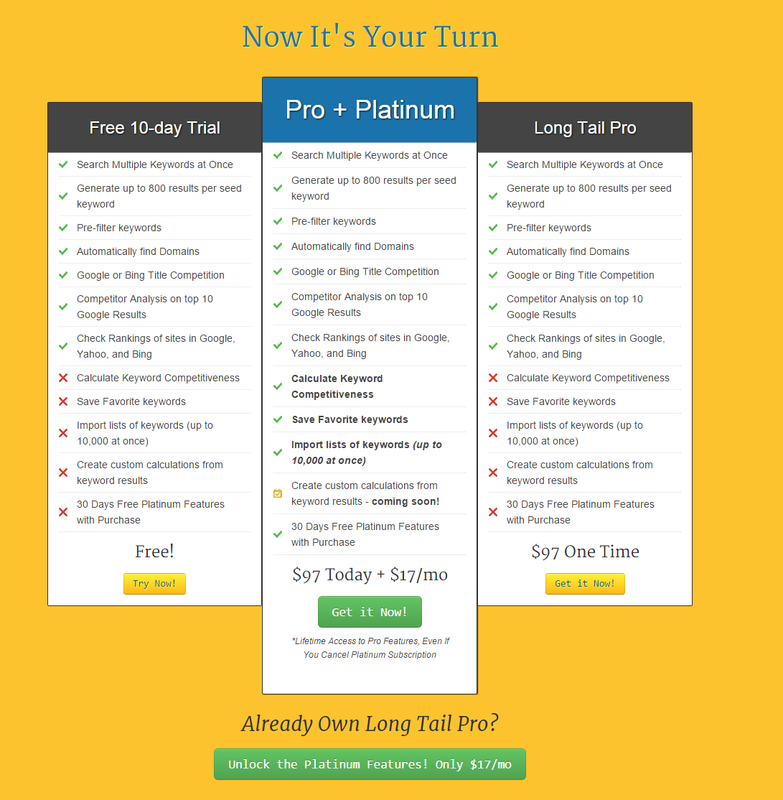 For Long Tail Pro you can pay $97 one time fee and access the features for lifetime. If you want to buy Platinum version then you’ll have to pay $17/month extra to access all the features. Download the free trial version for 10 days and then decide. Purchase the standard package for a one-time fee of $77. Purchase the Premium package for a one-time fee of $77 and a following $17 per month thereafter. You Can cancel at any time. Is there a steep learning curve? No. Once you go through the course thoroughly as I’ve described then you will be able to use the software immediately. That’s one of the great things about this product – there’s no attempt at over elaboration. Everything is explained in simple English. Is Long Tail Pro better than Market Samurai? After thoroughly using both for a good period, it’s my opinion the LTP is far smoother, easier to use, and economical than Market Samurai. MS still has good points, but I just don’t think it’s on the same level as Long Tail Pro. Plus, Market Samurai is more expensive at $149. Is it necessary to go Platinum? Honestly, I would say yes. If you have made the decision to invest in a product then why not get the best version available? Also, the platinum version reports an average keyword competition value for each keyword which is a handy tool to have. I had bought LongTail PRO . The features thie tool offers ia amazing. Unfortunately it is dead slow, yes Sloower than you can ever think of. I had it reinstalled a couple of times, but it didnt work either. Now I am looking forward to other tools like SEMRush .. I have try a free version of LongTail Software. Its a awsome i am try to purchase a pro version.of the long tail pro. I came across Longtail Pro this morning and downloaded the trial version. I was going to purchase the cheaper $97 version, but it does not have the KC score available. 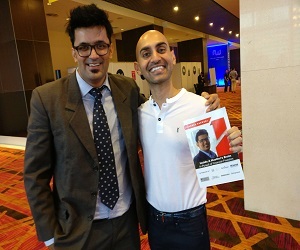 It seems from the research that I’ve done that the KC Score is absolutely critical to successfully using this program and being successful in this online business. Any advice? I have used Long trail Pro and is quite amazing. I would like to help a few of my clients that are using enterprise / web content management services with this type of plugins. Are there any plugins related to this for Sitefinity CMS, or WordPress? Talking about my experience with Long tail pro, it satisfies all the basic as well as advanced keyword requirements and the suggestions are spot on. Many times while searching for a long tail keyword, I found it difficult to get good results with other tools, however pro version is quite attractive in that matter. Competitor analysis and PPC monitoring are attractive features of this tool. thanks for sharing such information. Nowadays, I think long tail is pro using Moz for keyword research. is it correct?